A quick glance through my Instagram feed & it’s not hard to decipher what I’m all about. 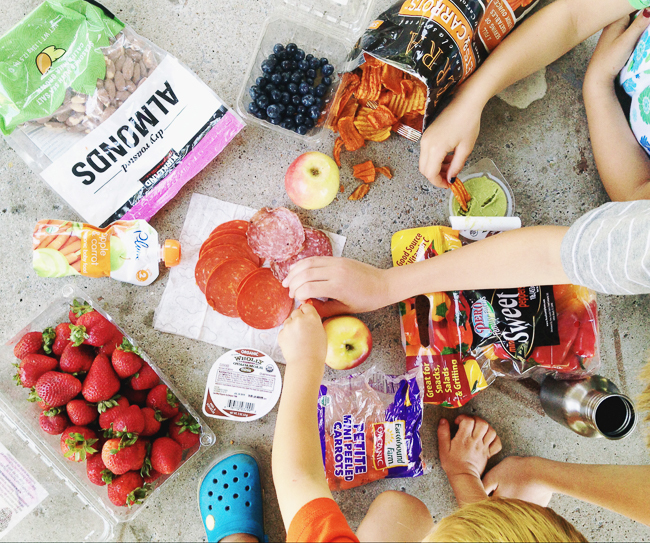 Food, kiddos, cute shoes & food. 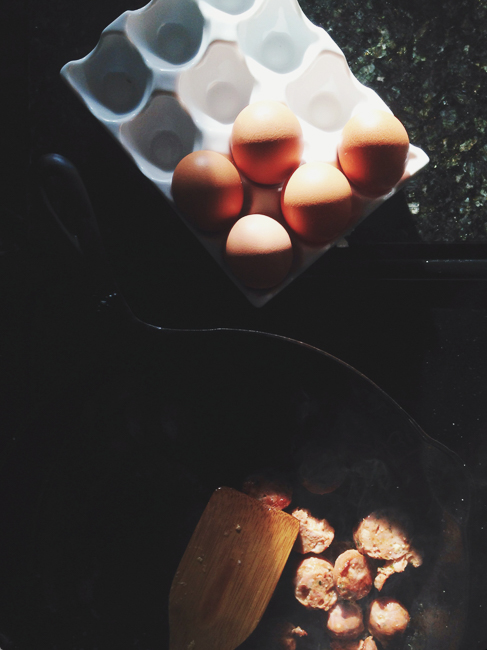 When I first started snapping pics of food on my feed, they really weren’t anything special. It wasn’t until I started applying the same principles to iPhoneography that I used in shooting food with my DSLR, that people really started to take notice of what I was snapping. By working to create an inspirational foodie feed, I’ve been able to grow, make connections & push myself further & further with creativity. Every day I get to create a tiny image of beautiful food that people can come back to view again & again. 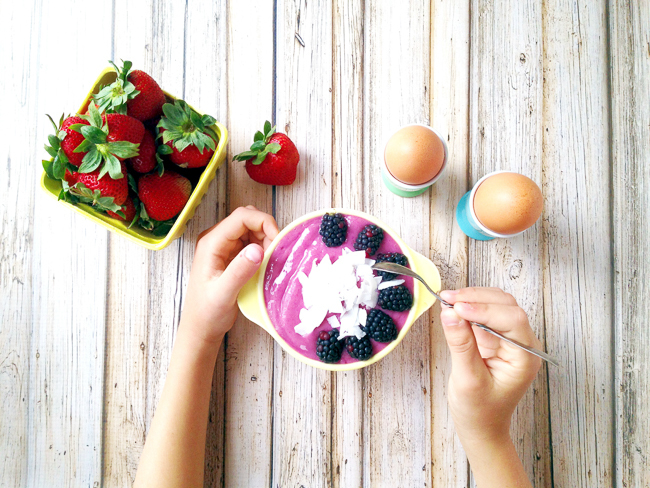 I’m going to share some of the secrets & tricks I’ve learned along the way to help you create beautiful food Instagram feed! All images shown here were taken with my iPhone 5. 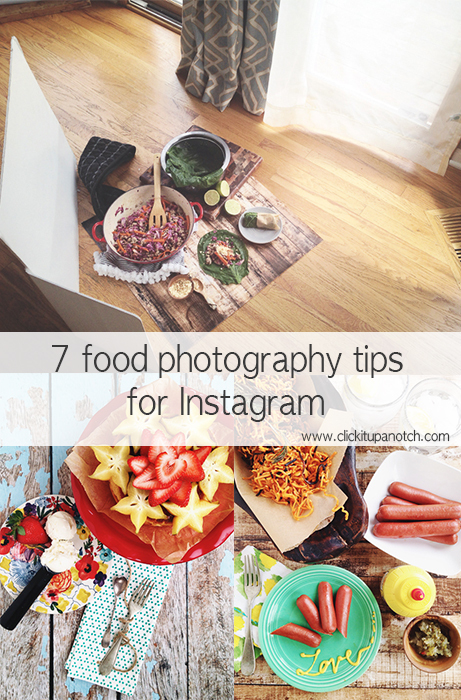 Read more food photography tips – Eat Pretty Things. Too often, when we’re snapping food with our phones, we forget one of the most important factors in getting a great image – light! Turn off those harsh, overhead, indoor lights. This will help keep your shots from looking flat or having unappetizing color casts. Try & find your best source of natural light in your house. I typically snap all my food shots on the floor of my eat in kitchen area where I have 4 windows & curtains to help adjust my light. I set up my shot just outside of the bright light that spills in. I want the light to be in my shot but not so harsh it gets blown out. I don’t take many food pics when I’m at a restaurant, mainly because it can be disruptive to other people & I’m too busy wrangling 4 children anyway. If you happen to be at a restaurant & feel comfortable, try & find a good window seat. Sitting next to a big, bright window will help keep your image well lit but too often restaurants also have yellowish overhead lights above each table. In this shot, we were the only people at the ice cream shop so I used one hand to cover the light bulb that was hanging directly over our table & the other hand to snap the shot. You can still see a slightly yellow color cast next to my coffee, but I only took one shot & my hand was able to cover most of the bulb. If you’d use a reflector in dlsr photography, why not in iPhoneography! You don’t even need to buy a real reflector if you’re not sure you’ll use it. I use an inexpensive piece of foam board I got from a craft store! After finding the best spot of natural light to set up my shot, I get out my reflectors. 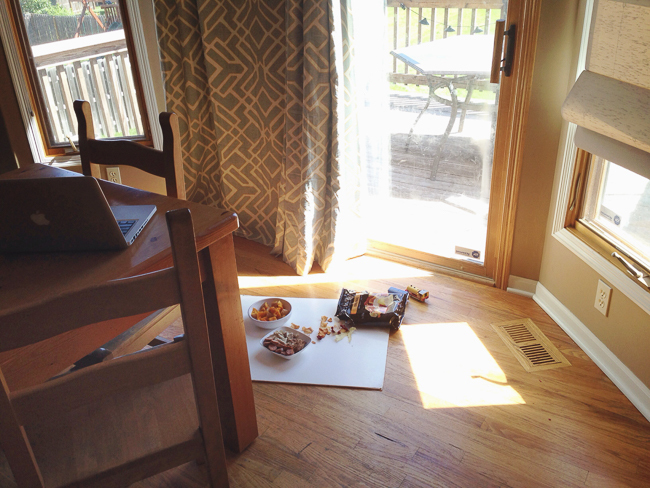 By moving my reflector board around I can bounce the window light into the shadows in my frame. Sometimes I’ll even use two reflectors if my props start to create unwanted shadows. I also keep an inexpensive, sheer curtain panel handy to help diffuse the outdoor light. It might surprise you but I do actually take the time to set up each of my food shots. 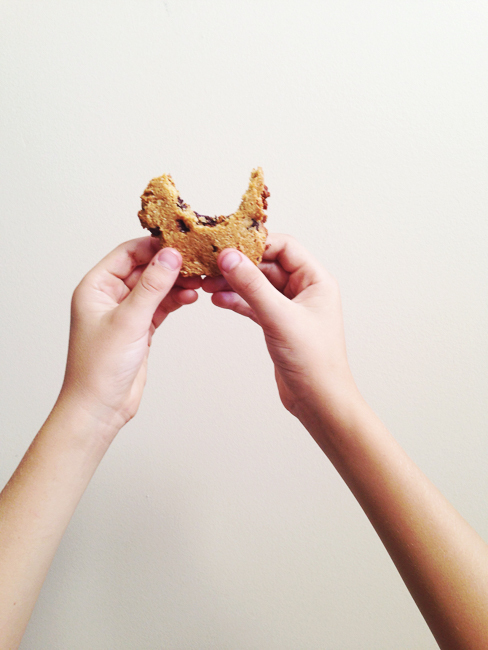 Sometimes it’s as simple as using a single item thoughtfully, like my son’s half eaten cookie. 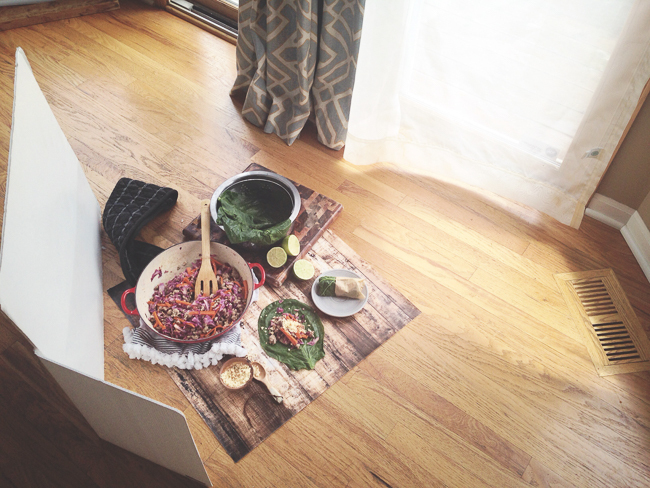 Other times it’s a full blown food styling session complete with props, linens & fancy plates. Either way, it’s important to take the time to compose each shot instead of just snapping your morning cereal straight on, in your bowl. Use ideas like the rule of thirds or leading lines to serve as inspiration. 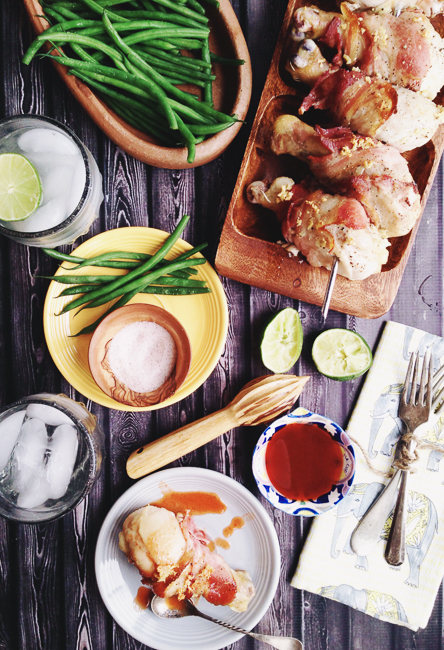 This is my favorite thing about food styling. 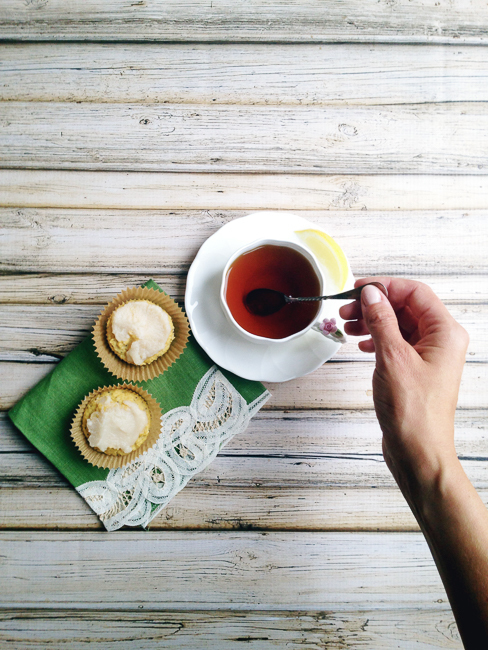 I love telling stories with my food shots. 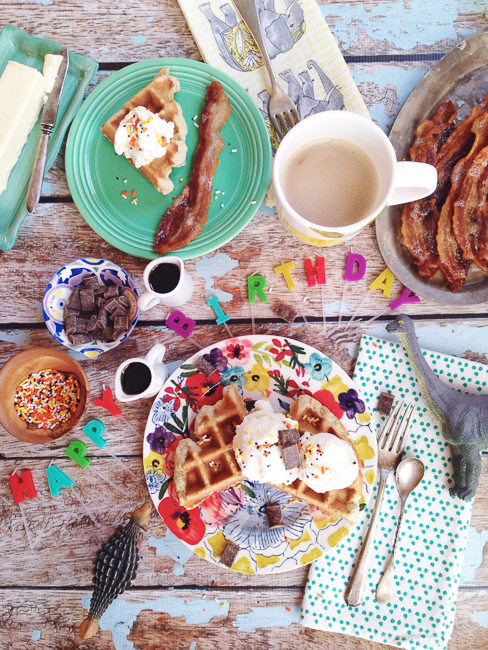 Sometimes it’s setting the scene for my 4 year old’s birthday breakfast. 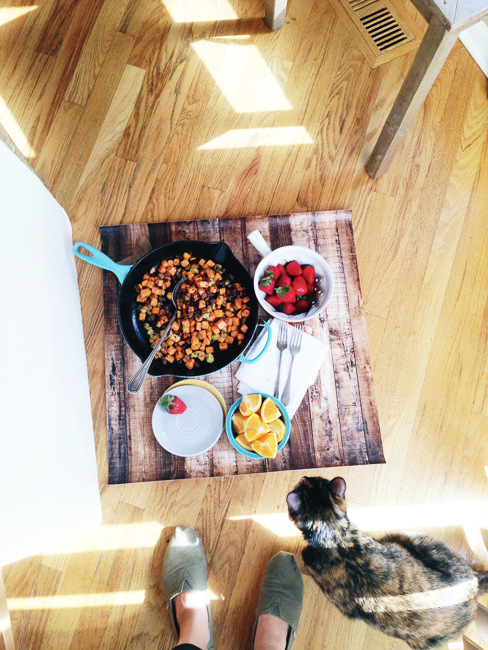 Every meal in our house is crazy & chaotic – we have 4 kids! 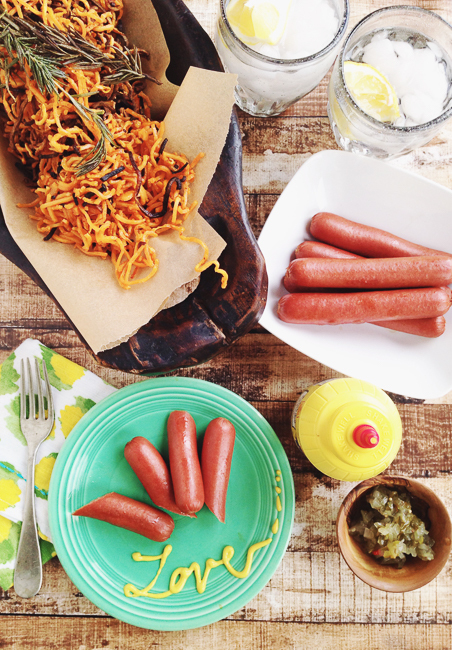 I wanted to convey both the celebration & the messiness of our meals – every meal with little kids, really. Also, the birthday boy has a serious dino obsession so no image of his morning was going to happen without a dinosaur or two. 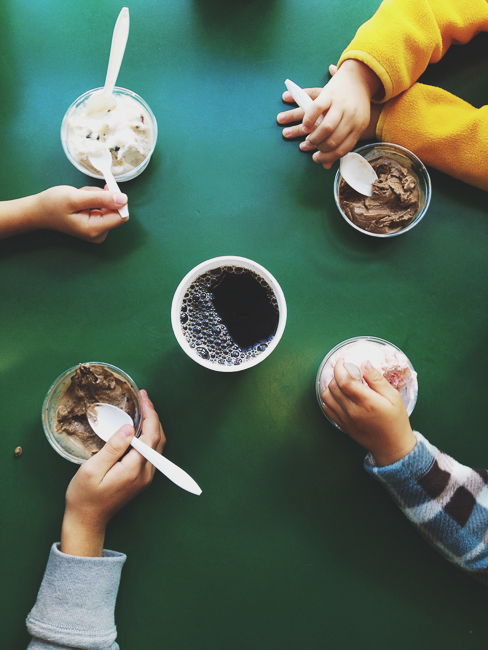 This story is about showing how we eat on a road trip. When we travel it’s easier to hit the rest stops for snacks & running off steam. I love that my youngest son is sitting on the table – the only way he could compete with getting any food next to my older kids. Also, even though most of our food has to be packaged on the road, we still make an attempt to eat as healthy as possible. Even just giving a sneak peak into how we cook when we’re camping tells a story. 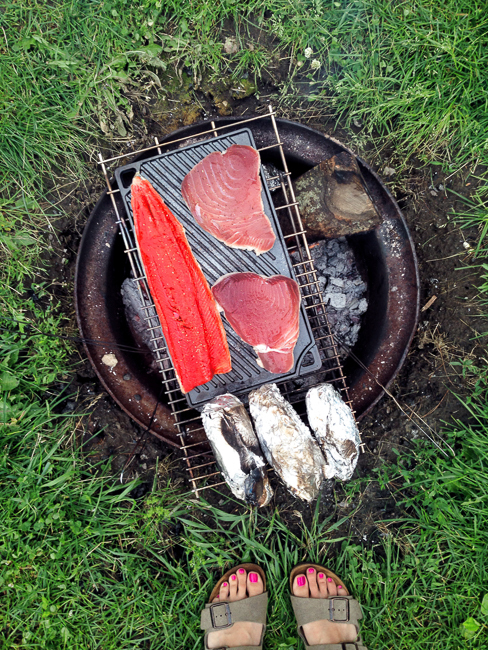 Fresh fish on the charcoal fire pit, sweet potatoes wrapped in foil, green grass & of course, my Birkies. Story telling is a great way to connect with your audience as well as pull them into each photo so they want to know more! This is where you get to step outside of showing your bacon & eggs every morning for breakfast. Do something creative & unusual that you might not think of initially. Using a condiment? Write out a message in mustard. For the 4th of July I hadn’t made any festive desserts or red, white & blue anything that day but knowing I wanted to post something I just lined up some fresh cherries into a 4! Another time this worked great for me was when I didn’t have any ingredients to make frosting for my daughter’s birthday cake so instead I just cut up some fresh fruit & it created this beautiful image on the cake. I started the post talking about natural light & trying to get the best light possible, but I don’t want to encourage you to shy away from the shadows either! You may be surprised to see how using shadows & the right apps to edit your pictures, you can create a contrasted image quite easily. When working with split lighting, decide where you’d like your phone to ‘meter’ off of. Yes, your phone can actually meter off light in the image! By tapping any section of the image on your screen you’ll see the image adjust to whatever light you touched. Want to add more light to your image? Tap the darkest shadows on your screen. Want to get more shadow? Tap the brightest light. Don’t just stop there though. You can adjust your light levels by tapping any section of the image on the screen. If I’m shooting something where I want contrast lighting I will usually take 2 images. One bright & one much darker. Then I edit the best one in an app. It’s very easy to add light back into an image but it’s much harder to bring something back from being blown out or over exposed. The thing I love about Instagram is that your food doesn’t have to look the same way it does when you’re shooting with a DSLR. It naturally won’t be as sharp & your white balance won’t be perfect but there are some apps that have great filters that can help you come close. 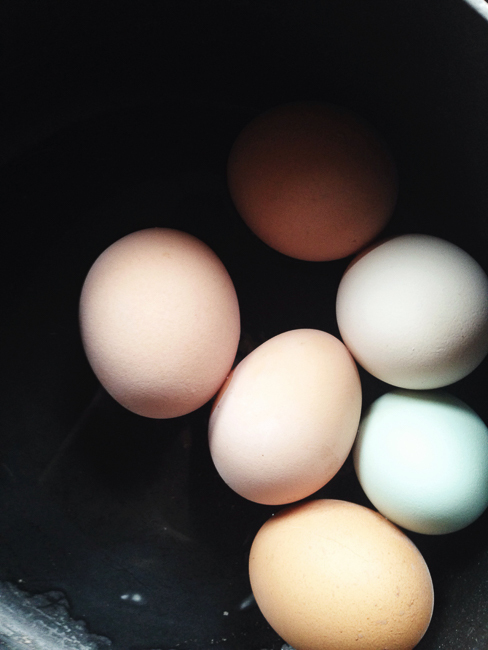 The biggest concern when choosing the right filter is you don’t want to pick one that’s tinted that will make your food look pink, blue or purple. I also like to use multiple apps to get just the right look. I know, it’s fussy, but once you get used to the filters you love, it’s easy! I typically use Snapseed first. Once I’m in there I can adjust my brightness, contrast & temperature. I also can rotate my image or correct the horizon. Once I’m done there, I’ll open Afterlight & choose a couple of my favorite filters to layer. I really like the ‘relic’ & ‘russ’ filters. 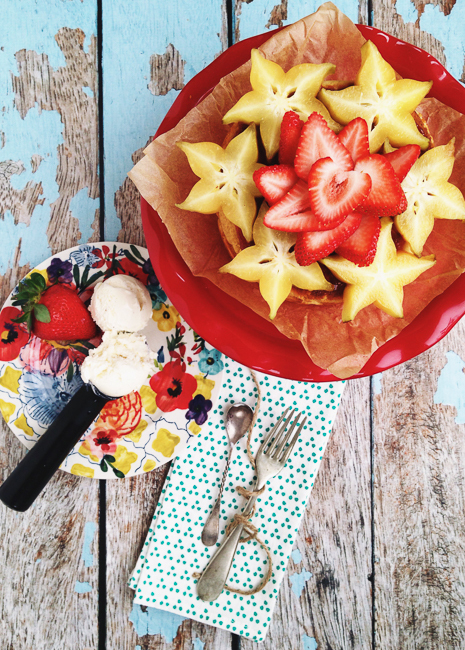 Do you love snapping food with your phone? Leave a comment with your best tip below. Excellent tips and photography. I can’t wait to follow them and more. I’m a new subscriber for sure! I love this post!! I’m always trying to get better pics of my food on my iPhone. (Or any camera, actually.) This is really helpful! Can I also ask where you got your faux wood backdrop that you use for the “reflector” shots?? Love, love, love this post! Thanks for sharing! Aw thanks, Kay! Glad it’s helpful! Hey Andrea, I get my vinyls from Swanky Prints off etsy! Can you please tell me how you made or where you got those backgrounds for the shots the wooden ones? Thank you so much for the tips! This is great and it helps me a lot! Very good!! I love your creativity! 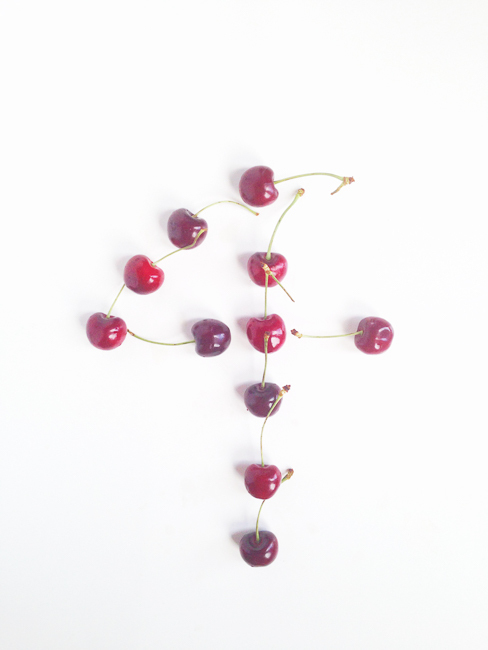 Hi it was a pleasure reading your post if you could tell me how did you take or edit the picture where u have alligned the cherries into a 4. I WOULD LIKE TO KNOW HOW DID YOU GET THAT EFFECT. Hey Mohini. I used a piece of white foam board from the craft store & placed the cherries in the pattern. I took it with my iPhone & edited it in my phone. Hope that helps! Thank you for another amazingly helpful article! Ah, I am still stuck at what to narrow my photos down to. My brand is real food, fitness and motherhood. Is there any chance you can peek at my IG feed and give me insight into what you see to narrow down my branding? @real_fit_mama Thank you again! Then I got to the bottom and saw that Trisha from Eat Your Beets was the the one that wrote this and it all made perfect sense why everything looked awesome. Thanks for putting together great tips. I can’t wait to read them all when I’m not at work. Really great article. I love your use of the vinyls – checking etsy now! amazing pictures Trisha, i liked them a lot! Thank you for this superb article, so incredibly useful. Lots of originality and creativity in your feed, thanks for sharing the secrets!! Thanks for sharing. This post makes me really hungry)I would use your strategy and advices for my IG. In any event, it’s not exactly rocket science to promote and make money on your food-IG nowadaays: to follow a a thought-out strategy and use third-party apps, e.g. Zengram for incresing real followers and Hootsuite for managing. You don’t run the risk of wasting time this way. Can you please tell me how you made or where you got those backgrounds for the shots the http://www.gapleqiuqiu.com/ wooden ones? Nonetheless http://www.bakarat.org/ the way in which remedies tend to be discovered to manage just about almost most the strategies is typically precisely what problems.